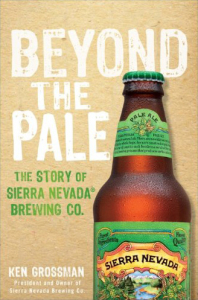 Larger View Beyond the Pale: The Story of Sierra Nevada Brewing Co.
Hard Cover, 256 pages, 6.5 x 9.5. Ken Grossman couldn't have known that his early fascination with taking apart household appliances would eventually lead to welding together Sierra Nevada's first malt mill and customizing its bottling equipment. Although obstacles obscured Grossman's path, his determination to brew the kind of beer he liked to drink and be his own boss led to the success of one of America's best-loved craft breweries. From his youthful adventures to his experience in dealing with the complex landscape of the beer industry, Beyond the Pale chronicles Grossman's trials and tribulations in building a brewery that now produces more than 800,000 barrels of beer annually. Grossman recalls the role models and life experiences that fed his curiosity and drive--from a neighbor's obsession with science and gadgets, to the friends who drew him to hiking, and, finally, to the brewing community that provided both support and friendly competition. Beyond the Pale details Grossman's start, from homebrewing as a teenager, to becoming a skilled brewer, and, later, to building a small brewery in the town of Chico, California. It shares the business decisions that nearly broke him, yet eventually drove him to success. The sum total of his life provides the foundation of the "Sierra Nevada way," a company philosophy that emphasizes sustainability, nonconformity, following one's passion, and doing things the right way. Since Grossman founded Sierra Nevada in 1980, part of a growing beer revolution in America, critics have proclaimed his beer to be "among the best brewed anywhere in the world." Beyond the Pale describes Grossman's unique approach, focusing on people, the planet, and the product. His story shows how, with hard work, dedication, and integrity, you can be successful in following your dream. KEN GROSSMAN is the founder of Sierra Nevada Brewing Co., established in 1980. Ken's passion for good beer began when a friend showed him the basics of homebrewing. He began brewing five-gallon batches of beer on his own and soon became a proficient homebrewer. In 1976, Ken opened his own store, The Home Brew Shop, and, soon after, began building a small brewery in the town of Chico, California. His goal: to brew exceptional ales and lagers. An avid backpacker, Ken named the new company for his favorite hiking grounds--the Sierra Nevada Mountains. Finally, on November 15, 1980, the Sierra Nevada Brewing Co. brewed the first batch of what would soon become a landmark in American craft brewing: Sierra Nevada Pale Ale. Today, the Sierra Nevada Brewing Co. is considered one of the premier craft breweries in the United States.